The American is one of just three players in red figures after the first two rounds, tied for the lead on one-under par with fellow major winners Jim Furyk and David Toms following a combative 70 on Friday. Furyk shot a 69 in McDowell’s company early in the day as the Ulsterman faded at the finish in what he described as “brutal” test of golf in fast-running conditions. The 2010 champion raced to two under par for the championship with four holes to play but dropped three shots in his last four holes to add a 72 to his opening 69 to finish the day two shots off the pace. “It’s just tough to have fun out there, I got to be honest with you. It’s just a brutal test of golf,” said McDowell, who looked like he had gone 15 rounds with Mike Tyson. “I’m disappointed to bogey three of the last four today… but that’s what this golf course can do to you in a heartbeat and to be honest with you. Harrington was left reeling by a first round 74 featuring two four-putts and a three-putt but inspired by Toms (69) and a highly competitive Davis Love, he used the blade just 25 times as he fired four birdies in a 70 to go into the weekend with his hopes of victory intact, just five strokes behind the leaders on four over. Insisting that level par was still the target score after four rounds, Harrington added: “I have work to do. I need to open it up at the weekend and let it happen. I have got to certainly shoot four under the next two days to be the winner this week. The game is there. I just have to let it happen. World No 21 McDowell came into the US Open on the back of three missed cuts from this last four starts. But he insisted he had good vibrations about a return visit to the US west coast for a US Open and a first round 69 boosted his confidence. Dressed in pink slacks, the 32-year old looked every inch a US Open champion as he set off from the ninth. But while he three-putted his opening hole from 45 feet for bogey, he bounced back with a birdie from 15 feet at the 10th and put on an exhibition for the next 13 holes. A bunkered approach left of the 12th cost him a shot and while he had to chip and putt for par at the 13th, he knocked in 35 foot bomb up the hill at the 15th to get to two under for the championship. The tee at the monster par-five 16th was moved and playing “just” 609 yards of its full 670 yards. But McDowell still made birdie, following three perfect shots with a perfectly weighted 15 foot put down the hill. He couldn’t birdie the par-five 17th from the left trap or the short 18th across a slippery slope. And while he bogeyed the first after carving his tee shot down the hill, he did well to limit the damage to just one stroke when he avoided three-putting for a double bogey by bravely holing from 10 feet for a five. Tiger Woods tees off on the ninth. Photo Eoin Clarke/www.golffile.ieJust when he looked in total control, McDowell missed the fifth green and bogeyed and then bunkered his approach to the sixth and dropped another shot. Unable to birdie the driveable seventh, the 32-year old finished on a low note when he went through the back of the eighth and couldn’t get up and down for par. Furyk, the 2003 US Open champion, also started with a bogey but came close to an ace at the 15th, picked up another shot at the par-three 13th and followed a bogey at the fifth with a birdie at the seventh for a 69 that left him in front on one under. Paying tribute to Furyk, McDowell said: “You’ve got play Jim Furyk golf. I watched yesterday and I watched it again today. He doesn’t take chances he doesn’t have to take on. Chasing the third leg of the career Grand Slam following his back to back Open triumphs and that memorable US PGA win in 2008, Harrington birdied the fourth and then followed bogeys at the tough fifth and sixth holes with two birdies to move into the top 15. After holing a 25 footer from the fringe at the seventh, where his ball teetered on the lip behind the hole before dropping, the 40-year old hit a great five iron to three feet at the 192-yard eighth to leap up the leaderboard before slipping up with a bogey at the ninth. He bogeyed the 13th when he failed to get up and down from rough right of the green, missing from inside six feet for par. But he played superbly coming home, birdied the par-five 16th to get back to level for the day, left a 12 foot chance short at the 17th but the got up and down from sand at the last to share 18th place on four over. “I’d say I played better or at least the same today as I did yesterday,” Harrington said. “At least I had a good day on the greens today after a horrible day on the greens yesterday. “It’s a pity I didn’t shoot the 70 in the first round because then I would be sitting there for the next two days and not having to chase. At four over par it feels like I have to go out there and chase a score. “Funnily enough there are plenty of places out there to make birdies. Hit a drive down the fairway and you have wedges into the greens. This golf course gives up plenty of birdies. Harrington is delighted that his putting is “back” and barring a round in the mid-60s by Woods today that he believes would end the tournament, he reckons he’s still got a chance. “Augusta was nice coming down the stretch again,” he said, recalling his eighth place in the Masters. “But there are 27 holes to go before I get to that last nine. “My expectations were too high yesterday and I was definitely trying too hard. I was happy with my game and having got my putting back I had big expectations and I put a lot of pressure on myself. Today I felt a lot more relaxed going out there and I reaped the benefits of that. 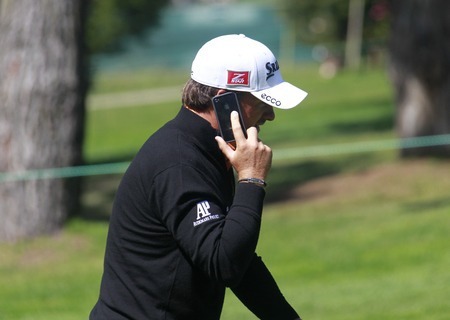 Graeme McDowell on the phone on the ninth at the Olympic Club. Photo Eoin Clarke/www.golffile.ieGraeme McDowell will be drawing on fond memories of his Pebble Beach triumph when he tees it up in his seventh US Open at the Olympic Club on Thursday. 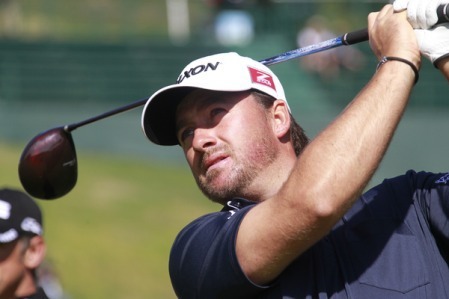 Graeme McDowell feels good about his chances at The Olympic Club. Photo Eoin Clarke/www.golffile.ieGraeme McDowell reckons he has a mental edge of 60 percent of the field as he prepares to challenge for his second US Open title in three years. Massacre at The Olympic Club?